- Yarn for a large Crochet “Camomile” (factory named after Kirov) knit in blue color in two threads. - some white, black, bright pink (you can red) and blue threads. It is rather uneconomical to buy yarn of all these colors, so I buy hanks of ordinary floss. - Hooks for a large Crochet: hook No. 4 (for a little body, legs, ears, legs), No. 2 (for peepholes). 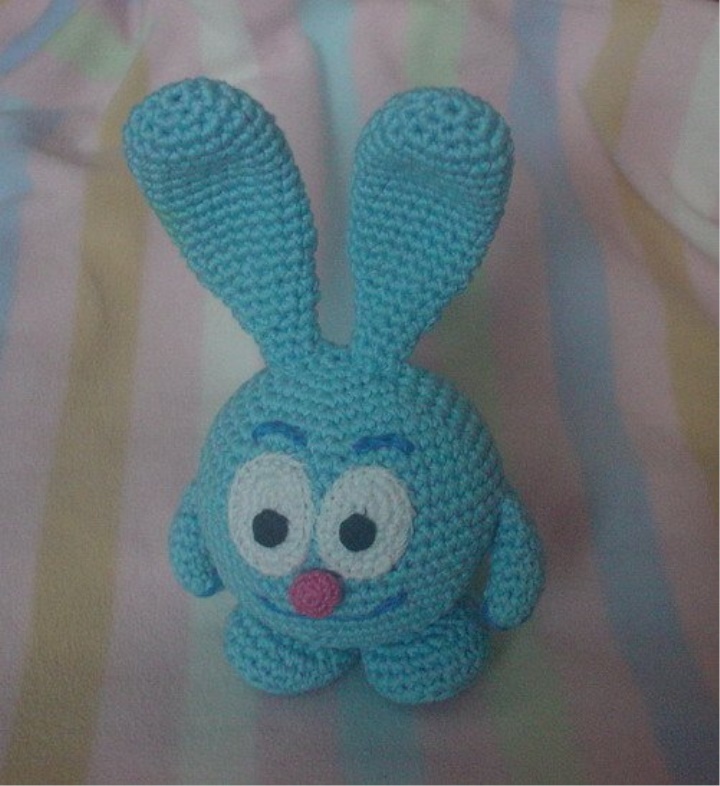 - Fleeting eyes for toys, if you do not knit them, and glue ready. - synthetic winterizer or other lightweight filler, as well as conventional cotton wool. row, and focus on it, and then knit in a circle. 2nd row: in each Art. previous row 2.B.N. = 12.B.B. B6 4th row: * 2 Stein 2d, 2st bn *, repeat from * up * 6 times = 24st.B. 5th row: * 3rd b.n., 2nd st.b. *, repeat from * to * 6 times = 30th square b.n. 6th row: * 4th st.b., 2th st.b. *, repeat from * to * 6 times = 36 st.b. 7th row: * 5th.b.n., 2st.b.n. *, repeat from * to * 6 times = 42st.b.n. 8th row: * 6th.b.n., 2st.b.n. *, repeat from * to * 6 times = 48.b.d. 10-18 lines: knit in a circle without increments st.b. Row 19: * 7th cb.n., skip to 1st cb.n. of the previous row, Art. B. *, repeat from * to * 6 times = 48 st.B. Row 20: * 6th.b.n., skip to 1st.b.n., st.b.n. *, repeat from * to * 6 times = 42st.b.n. 21st row: * 5th cb.n., skip 1st ct.n., st.bn *, repeat from * to * 6 times = 36th cb.n. 22nd row: * 4th stage of biological history, skipping of 1st stage of biological history, art. Of biological history *, repeat from * to * 6 times = 30th of biological history. 23rd row: * 3st.b.n., skip 1stst.b.n., st.bn.n., repeat from * to * 6 times = 24th.sb.n. 24th row: * 2nd bi., Skip 1st bi., Senior bi *, repeat from * to * 6 times = eighth bi. Row 25: * 1st.B.N., skip 1st.B.N., Art.NB *, repeat from * to * 6 times = 12ST.B. 26th row: * skip 1st ver. Bn, st.bn *, repeat from * to * 6 times = 6 stead. Taurus is ready! Check whether it is sufficiently filled with filler, if necessary, dissolve a couple of rows and add. 2nd row: in every art. previous row 2.B.N. = 12.B.B. 3rd row: * 1st.B.N., 2ndST.B.N. *, repeat from * to * 6 times = 18th ST.B. 4-15ryad: knit in a circle without increments st.b. We insert a wire (you can wrap it in a soft fleece for safety) and fill it with filler. 16th row: * 1st.B.N., skip 1st.B.N., Art.NB *, repeat from * to * 6 times = 12ST.B. 17-18 lines: we knit in a circle without increments st.b. Row 19: * 1st.B.N., skip 1st.B.N., senior B.N. *, repeat from * to * 4th time = 8ST.B. 20-21radyad: knit in a circle without increments st.b. 6 columns without single crochet (st.b.n.). Mark the thread of a different color with the end of the row, and focus on it, and then knit in a circle. 3-6 ranks: knit in a circle without increments st.b.n.Nabivaem filler. 7th row: * 1st.B.N., skip 1st.B.N., senior B.N. *, repeat from * to * 4th time = 8ST.B. 8-9 ranks: knit in a circle without increments st.b. Handles are ready! If you wish, you can also insert pieces of wire into the handles, if you want them to bend too. 1st row: 6 air loops, st.b.n. in the second loop of the hook, 3st.b.n., 5st.b.n.n. at last loop, 3rd biology., fourth biology. in the air loop into which we on the other side have already knitted 1st. = 16st.B. cb.n. 3 row: we knit in a circle without increments st.b.n. 5-7 row: we knit on a circle without increments st.b. .
8th row: we skip one column of the previous row and knit it in the next1.sb.n., 3rd st.bn, * skip 1st st.b.n., st.b. * = = repeat from * to * 5 times, 3 st.b .n., * skip 1st ver. bn, senior bi * * repeat 4 times. legs are ready! Stuff with filler. You can use the running eyes or knit floss threads. 1st Row: 4e.p., Art. in the second air loop from the hook, 1st cb., 5th c.b. in the last loop, 1st. n. n., 4. n. n. n.
5 Ph.D., 1 st.sb.n., 2 st.b.n. in the next 4 articles. 3rd row: we knit in a circle without increments st.b. 8 columns without a nakida (st. Bi. ), We close in a circle with a semi-column. Next, sew the pupils to the squirrel. 6 columns without single crochet (st.b.n.). 3-4 row: knit in a circle without increments st.b. 5th row: * skip 1st ver. Bn, st.bn *, repeat from * to * 6 times = 6 stead. sew the ears to the calf, then the legs and handles. Focus on the photo. Then sew eyes and nose. We make embroidery of the mouth and eyebrows and each handle with 2 stripes (claws). Embroider can be chain stitch. But embroidery does not always turn out to be neat, because I sometimes knit a strip of air loops (8 for a mouth, 2 for eyebrows), and then I sew each neatly.